**Today I have a guest post on The Nail Polish Enthusiast. Be sure to check it out. Thank you Amanda for letting me participate! 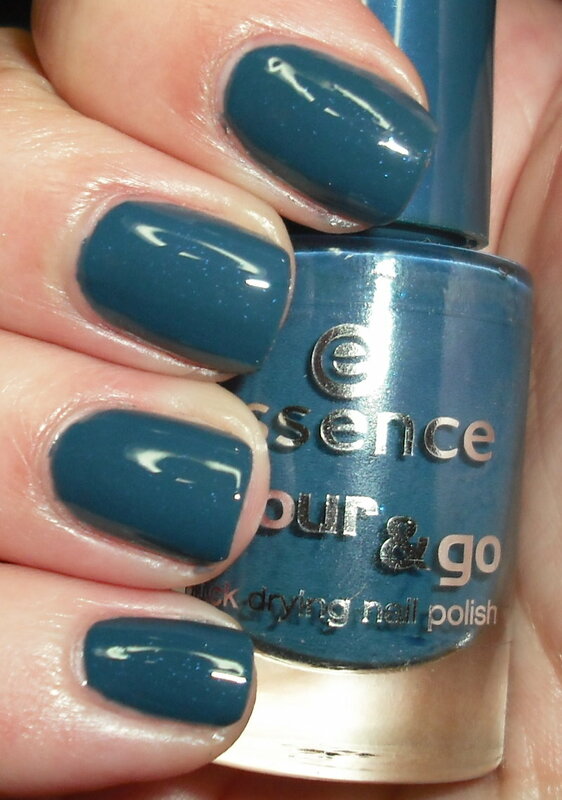 Today I have for an Essence polish called Underwater. Before I started this post I Googled it to see what other people thought of it. I was confused because many peoples pictures of Essence Underwater were an entirely different color than mine. It wasn't even remotely close to what I have. Thankfully, I found this post that explains there are two versions. I have the second version, and frankly I prefer it over the first. Underwater 2.0 is a slate blue with blue teeny tiny sparse micro glitters. I love this color. I think the glitter is a bit too subtle to see, but the color is beautiful. I love a great blue you all know that. You know what the name of this makes me think of? Are any of you America's Next Top Model fans? Those of you who have been watching the All-Star season will recognize this. Whenever I see this color now this song pops in my head! Happy Wednesday! Happy Thanksgiving to those who celebrate tomorrow! pretty color, that micro glitter is really nice! i loved allison's song but was really mad about the requirement of including "pot ledom" in every song... it was a horrible idea and really threw a massive wrench in allison's song which was obviously super personal and not silly at all. I know! I totally agree. That "pot ledom" bit was ridiculous. Wow, I absolutely LOVEEEE this! I am a huge sucker for hidden glitter/shimmer and for dusty teal colors as well, so this is right up my alley! Did you get this at Ulta or is it a Euro exclusive? I *think* I have version 2, but mine is not teal at all, it's a truer navy. Hmm! I love ANTM! Allison is probably my favorite this cycle. Gorgeous colour. Oh, and I love ANTM! Allison is my favourite!